An Interactive multimedia CD on Mahatma Gandhi. Over 550 Photographs, 30 minutes of film footage, 15 minute of Gandhi's voice. Collected works of Mahatma Gandhi running over than 50,000 pages with comprehensive indexing. This CD contains over 50,000 pages of Gandhi's writings arranged chronologically with intensive indexing and interactive retrieval paths, 15 minutes of Gandhi's voice, 30 minutes of film footage on him as well as 550 photographs have been included. This CD also explains in Gandhi's own words concepts like Ahimsa, Brahmacharya, Satyagraha, etc. practiced by him. 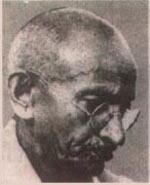 It is based on Collected works of Mahatma Gandhi brought out by Publications Division in 100 volumes. A short narration on Gandhi's life and his contribution to India's freedom struggle, illustrated with photographs, film footage and his voice. It also carries tributes to Gandhi by eminent persons. Over 40 important events from Gandhi's life presented chronologically, with his voice, film footage, some rare photographs and selected writings corresponding to each event. In addition, this section has a virtual walkthrough-of Sabarmati Ashram. An insight into thoughts and beliefs (e.g. Ahimsa, Aparigraha, Asahayog) practiced by Gandhi. The Collected Works of Mahatma Gandhi (C.W.M.G) in chronological order, running into over 50,000 pages. It has a comprehensive index which facilitates interactive search. This CD would be of equal interest to the academic scholar as it would be to a common user. Outside India - Bank Check or Demand draft should be in favors of "Bombay Sarvodaya Mandal" payable at Bombay, India of US $ 53.50 (including Shipment Charges). when bank draft sent by post. On realization of your Bank draft or Bank SWIFT message, you can expect to receive the CD within 15 days by Airmail/Shipment. Note - Gandhi CDs are available in USA & UK.